Buy AceComicals a Coffee. ko-fi.com/acecomicals - Ko-fi ❤️ Where creators get paid by fans, with a 'Buy Me a Coffee' button. We discuss comics in all their forms! Every two weeks your host Greg and his co-hosts Leon and Rahul will bring you their thoughts directly into your earholes. There's a blog too where you will find written reviews! Secured Payments. Support goes to AceComicals's account. 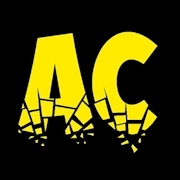 Upgrade AceComicals to a yearly Gold Membership with a one-time payment.